Geometry is only one of the six primary strands of math that is considered foundational to later mathematical learning. (The others are number sense, arithmetic operations, algebra, measurement and data analysis and probability, but I’ll save those for future posts). Basic geometric principles connect directly to other mathematical concepts and skills, such as naming, constructing, comparing, and sorting, and children as young as early toddlers are developmentally ready to explore basic geometric principles. During the toddler and preschool years children are making connections in geometry by analyzing the properties of two and three dimensional shapes. A box has corners and can be stacked, a ball is round and can be rolled. Children practice composing by building, and decomposing by taking apart shapes. If a square is smooshed, it becomes a rectangle, if a circle is smooshed, it becomes an oval. They interpret direction by using location terms such as “above” and “next to.” Playing with shapes develops spacial relationships and knowledge of relative positions, and can require immense amounts of planning, such as the child who builds a tower like the one in her favorite storybook. The amount of learning that takes place while playing with shapes, two dimensional of otherwise, should not be underestimated. 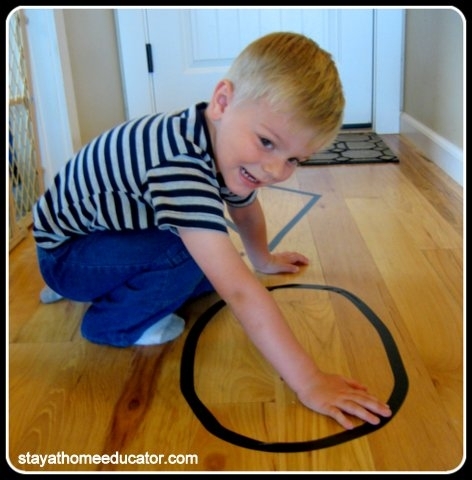 We know my little guy loves to trot, hop, roll, and slide (to name a few) so it is only appropriate that I share six easy shape games using the same fast set-up that really keep him moving! 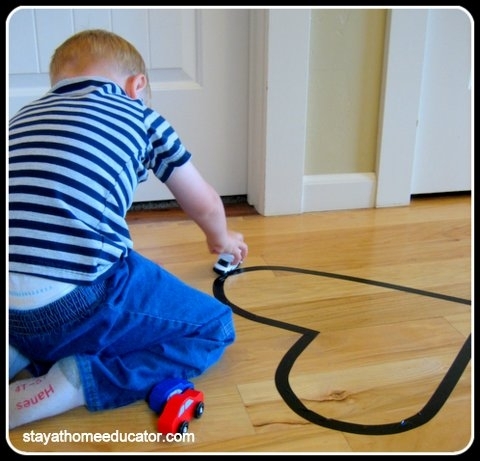 Begin by using electrical tape to make desired shapes on the floor. 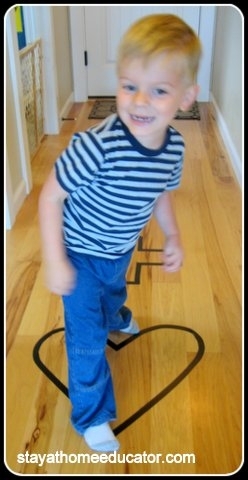 I prefer electrical tape over masking tape because of it elasticity and it does not leave any residue on my wood floors. 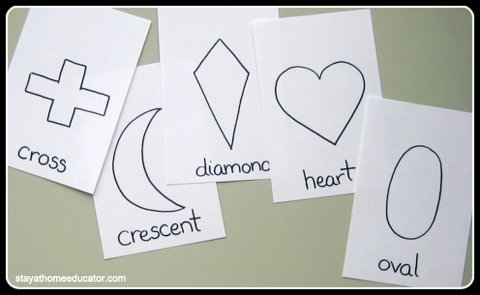 In this activity, I focused on three shapes William already knew (diamond, oval, and heart), and then added one he was less familiar with (cross), and one that was completely new to him (naming it crescent…not “moon”). You will also need to draw out the same shapes on index cards. Bean Bag Toss – You know how I love bean bags! Draw a card and throw a bean bag to the matching shape. Count the bean bags on each shape. Trace With Foot – This is the activity that actually inspired this post. With your kiddie standing in the center or at the top of the shape, have her trace the shape with her foot. (Note: It was very difficult for William to maintain his balance while tracing, so I knelt next to him so he could hang on to my shoulder. This was important because it allowed him to do a better job of tracing the details, like the curve versus the straight lines in the heart. I made him “pause” so I could get this shot). 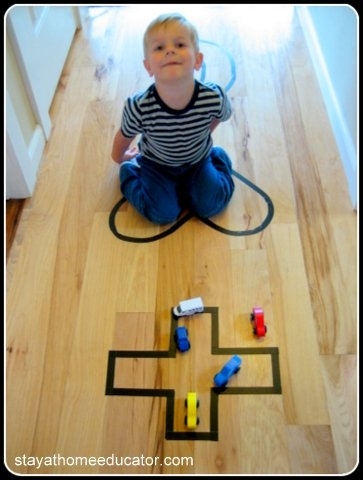 Trace the Shape With a Car – This was actually William’s idea when he mistook the cross for a road for his toy cars. Not a bad idea! 😉 This was actually much more effective than William using his hand. I think he saw a greater purpose when using his cars. Shuffle Board With Shapes and Cars – Once William was tired of using the tape as a roadway for his cars, William then began shooting his cars off and crashing them into one another. So, I used his play to make up game that is similar to shuffle board. Draw a card and roll a car to the matching shape, being careful not to overshoot. Of course, crashing other cars off the shape in encouraged (mostly by William, of course). 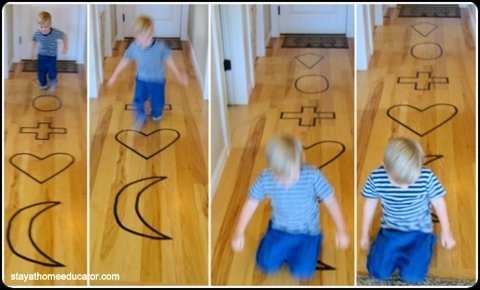 Draw and Slide – This is probably one of William’s favorites. No surprise. Draw a card, then run and slide to it. Love, love, love this activity. You need a figure 8 in there! 🙂 Pinned! Love this! I have twin boys (18-months) who have very different learning styles. One is definitely a mover and a shaker, so this will be great for him! We’re just starting to talk about shapes and colors now, but I will pin this to use in the near future. Love the tracing shapes and the bean bags, especially! Thanks for sharing. LOVE the mix of math and motor skills! We don’t have enough space for a draw and slide, but I am thinking the rest might be our next rainy day wiggle inside. Great ideas. I love using the floor. Thanks for sharing. Great idea to use electrical tape and bean bags. It looks such fun. I hadn’t thought to make shapes like his but it looks brilliant. This is such a great idea. I love that it encourages learning and physical activity. I featured it on my Kid’s Co-op Post. Thanks for linking up! A variation of this, my 6 year old gymnast is recovering from a broken growth plate in her ankle (not practice related of course!) so we had her do the same thing with sight words hung to her wall, with her foot elevated she traced te letters with her toes. As a coach, it is a great way to stretch their always moving muscles ! Just made shapes on the floor for some yucky weather day fun and my 2, 4 and 6 year olds are loving it! I played a really quick game with them, then left to fold laundry and they are making up their own games now! Thanks for the great ideas and inspiration! Thanks…love the plans, esp the one involving tracing over the shape with a car. I tried having the children walk over shapes created on the floor. They discovered the difference between a square and a rectangle! Great idea. But how can I try this if I have carpet all over in my apartment (I am renting it.) thank you. Electrical and painter’s tape will not leave a residue. I used this same activity when I taught public school and the tape worked fine on my carpeted floors, although it will not last as long. Thank you so much for such a quick reply. I will try your suggestions. I’ve done this with chalk outside but this is a good alternative for a rainy day. Thanks!